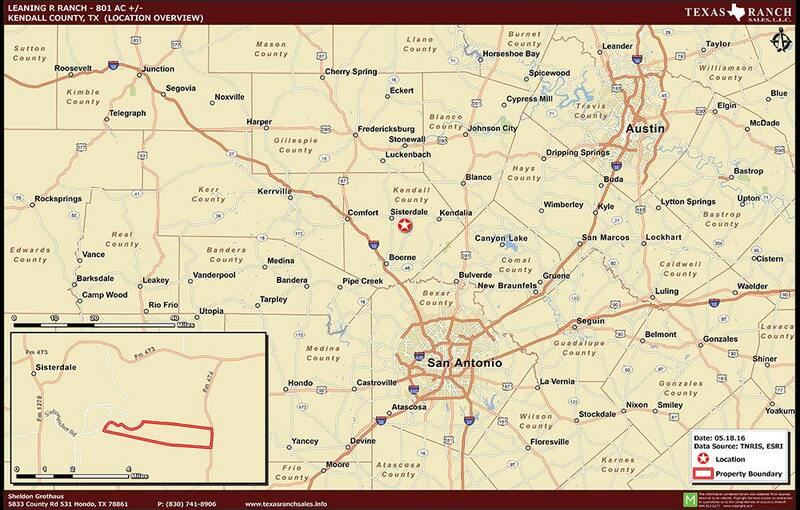 Leaning R Ranch is located just 45 minutes northeast of San Antonio in Boerne, Texas, Kendall County, length banks of the Guadalupe River. The Leaning R Ranch is a game fenced, highly improved show place and live water recreational ranch. An asphalt road begins at the ranch’s custom front-gated electric entrance and meanders by an improved compound of homes, barns, tennis courts, a lighted horse arena and manicured landscapes. The river and main house area is privately tucked away from the front compound affords the luxury of privacy. The main house is located in scenic proximity to the river. 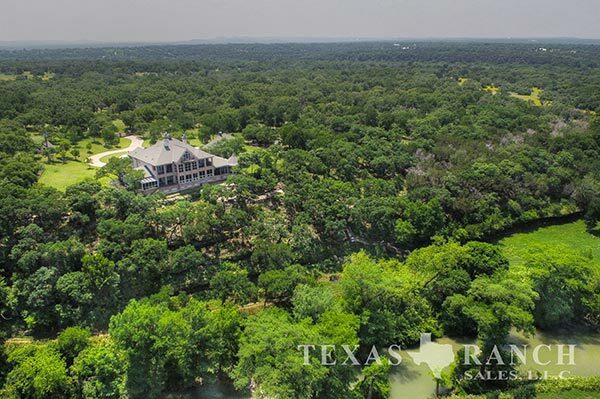 The main home overlooks the magnificent Guadalupe River, which stretches out over 1.4+/- miles from the west flowing Southeastern across the western property boundary. Its diverse flat to gently rolling topography and exceptional variety of native flora and trees characterizes the ranch. 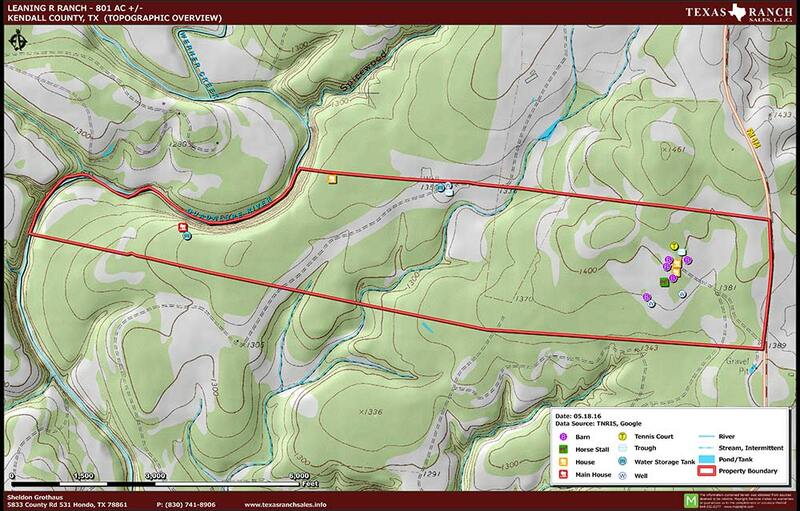 The property has a vast assortment of plant life consisting of large cypress trees, oaks, pecan trees, hackberry, and cedar, which have been strategically cleared in some areas. All of the plant life has been maintained to provide excellent forage and habitat for exotic and native wildlife and some cattle. The ranch has good water resources accessible for domestic livestock, wildlife and recreational use. Five electric water wells provide water for domestic use and livestock watering, while a wet weather creek provides surface water. In addition to the water wells, the main attribute of water is found along the banks of the Guadalupe River. The Guadalupe stretches across the ranch for over 1.4+/- miles and flows from North to South along the western border of the property. There are plenty of areas to soak up the sun along the river as well as high vistas to enjoy the views overlooking the Guadalupe River Valley. The Leaning R Ranch primarily functions as recreational and hunting ranch. Careful attention to wildlife conservation on the ranch creates excellent wildlife habitat as well as home to a variety of other small wildlife, songbirds, and breeding ground for a number of grey foxes and pigs. Game species on the ranch include trophy Whitetail deer, axis, scimitar horned Oryx, turkey, a large number of dove and quail. The ranch has excellent wildlife populations due to an intense wildlife management program including planted food plots, available forage, native brush coverage, and water resources. This awesome property has numerous building and site improvements. The main home is in a 9-acre gated area with a large circle drive enclosing a huge water fountain and a stunning rendition of an English and French estate. The home is over 7000 square feet and boasts 4 large, oversized bedrooms, a theater, billiard room and a huge living area with miles of views over the Guadalupe River Valley. The house also has a study with a spiral staircase leading to a large game room on the third floor with infinite views. A long porch and detached 4-car garage add to the style of the outside and the estate sits perched on top of a cliff overreaching the Guadalupe River. Exact mineral conveyance to be determined at time of new title commitment.